The talented filmmakers—or should that be, remakers— at Ghostlight recently reshot the 1987 Paul Verhoeven masterpiece, RoboCop. 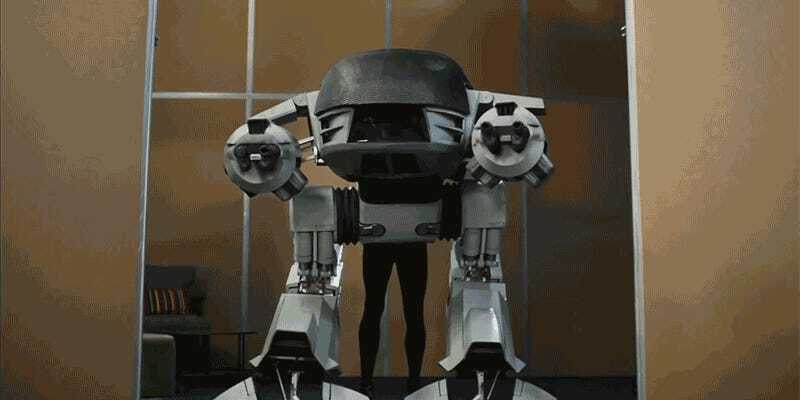 But since they didn’t have a million dollar Hollywood budget, they had to build all of the film’s props and practical effects themselves, including this impressive ED-209 costume. Is this version as believable as the original ED-209 was? Not at all. But as far as costumes this would be a pretty fantastic getup for going trick-or-treating at Halloween this year. And while the filmmaker’s behind-the-scenes video doesn’t give you a complete step-by-step guide on how to build your own ED-209 costume, it covers the basics, and you’ve got about nine months until October 31 to figure the rest out. What&apos;s The Best Movie Or TV Show You Saw Under The Worst Circumstances?